Our mission is to encourage and promote opera in the Greater Dayton area and to support Dayton Opera through fundraising, marketing and education activities. The Opera Guild of Dayton was founded in 1963. The Guild respects and values unique attributes, characteristics and perspectives of individuals and believes that a diverse membership strengthens its ability to meet and exceed its objectives. Opera Guild of Dayton was incorporated on November 21, 1963. 1964 — Began providing transfers to and from airport for opera cast. 1965 — Hosted first Opera Ball. 1967 — Hosted first Fashion Show. In the ’70’s hosted popular After-Opera suppers. In the ’60’s and ’70’s helped in ticketing, advertising, hosted teas and a myriad of other activities and events. IN-KIND donations through time and effort numbered in the thousands of dollars per year during those early years. Guild membership swelled to 500 in 1978. 1981 — Opera Guild was incorporated as a separate entity. 1981-1985 — The Guild provided 819 nights of home hospitality for the incoming opera stars and this avenue of tremendous savings continues today. A conservative estimate of this valuable in-kind contribution from 1963 to 1999 is $500,000 in savings to Dayton Opera. In the first 36 years (1963 to 1999) the funding and in-kind contributions were well in excess of a million dollars. 1985 — Began providing funds for English surtitles. First production to implement this was Tosca. The Guild has been underwriting the surtitles or providing operating support ever since. In the ’90’s the Guild also began sponsoring one of the opera productions each year in addition to continued operating support. The Guild has contributed significantly to every special campaign and fund drive, in addition to their yearly pledge to operating support and sponsoring an opera production. Support of Dayton Opera’s Artist-in-Residence began in 2012. 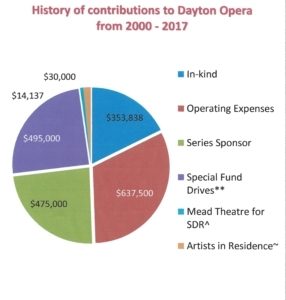 To date, a total of over $2,000,000 is direct financial support to Dayton Opera for 2000 to 2017. To read all of the 2017-2018 accomplishments, click here or on “Join The Guild” in the menu above.